So you can tell from the title we're going to discuss BROWNIES. To get started, let's look at a recipe that I found on www.epicurious.com. This happens to be the favorite of the late actress, Katherine Hepburn; I'm told it's a favorite of brownie-lovers the world over. I don't see much difference from the recipe I always use (other than I use 1 teaspoon vanilla and ½ teaspoon of salt), though, but since this is about bling, what the heck, why not go with an actress' recipe? Melt together 1 stick butter and 2 squares unsweetened chocolate and take the saucepan off the heat. Stir in 1 cup sugar, add 2 eggs and 1/2 teaspoon vanilla, and beat the mixture well. Stir in 1/4 cup all-purpose flour and 1/4 teaspoon salt. (In the original recipe, 1 cup chopped walnuts is added here as well.) 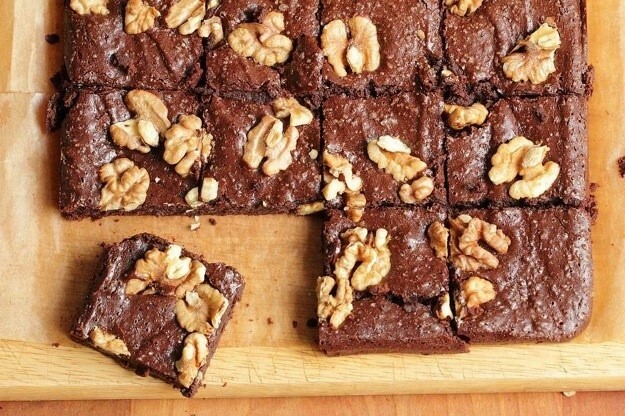 Bake the brownies in a buttered and floured 8-inch-square pan at 325°F for about 40 minutes. If you want to jazz up your act you can put a square of brownie on a plate with a little blob of créme fraîche and a scattering of shaved chocolate. Add lots of nuts to the batter and then top the batter with whole and halved walnut or pecan pieces. The mouth-feel a chunk of nut adds to anything is truly irresistible. 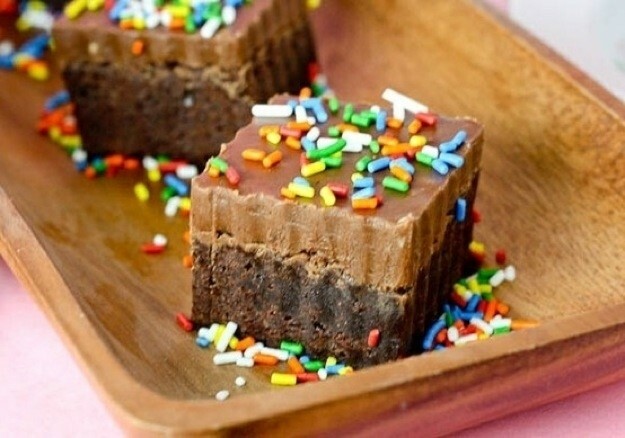 Cover a pan of baked brownies with your favorite fudge recipe, and then top that with your favorite sprinkles. This is so decadent! 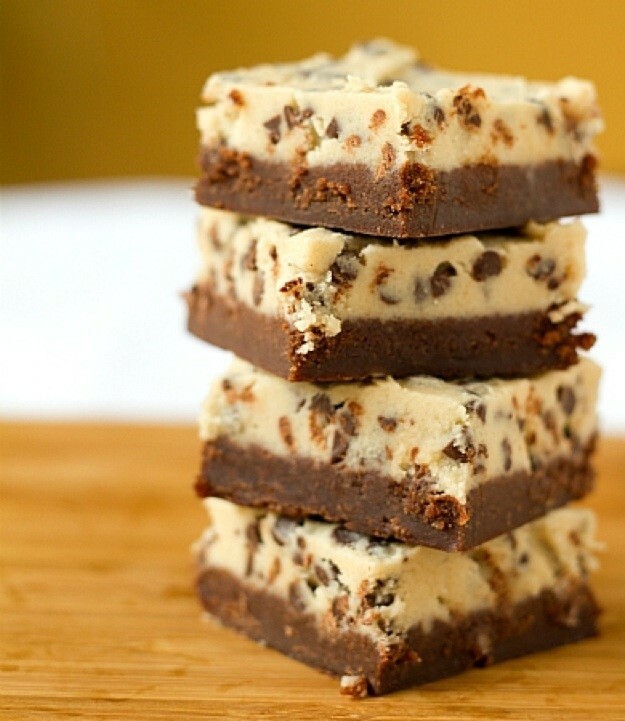 Cover a pan of baked brownie with chocolate chip cookie dough. 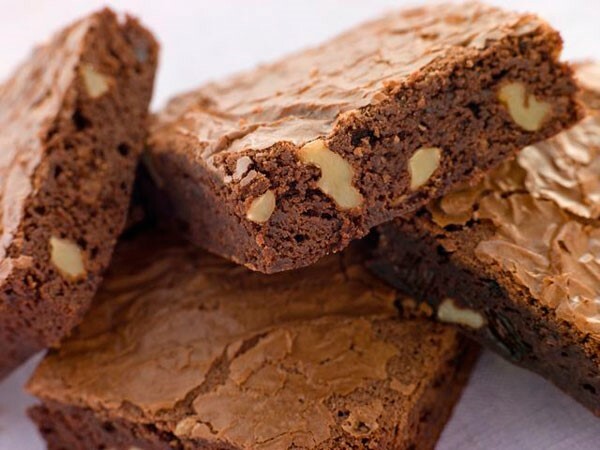 Because you're not going to bake this, you just omit the eggs from your favorite chocolate chip cookie recipe and spread the dough over your already baked brownies. Can you imagine how delectable this is? 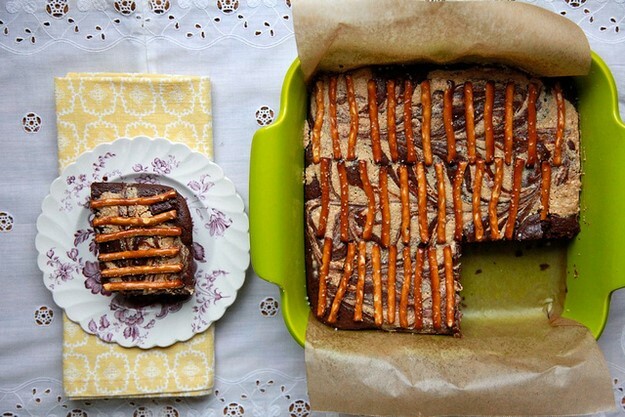 Slather the top of your baked brownies with a peanut butter and chocolate frosting and then top that with pretzel sticks. We can thank Joy the Baker for this paradigm shift. 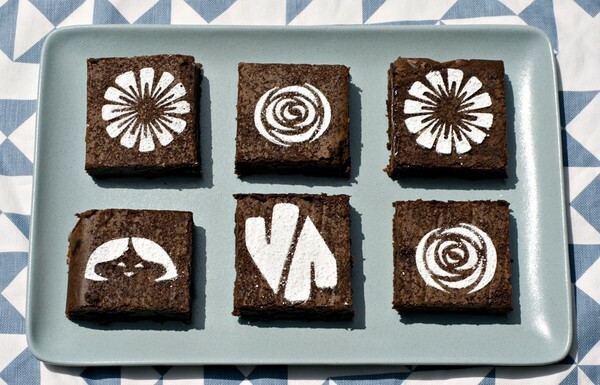 How about stenciling some pretty and fun patterns onto a pan of baked brownies? Craft stores sell pre-cut stencils or you can design and cut your own out of worn out manila file folders. 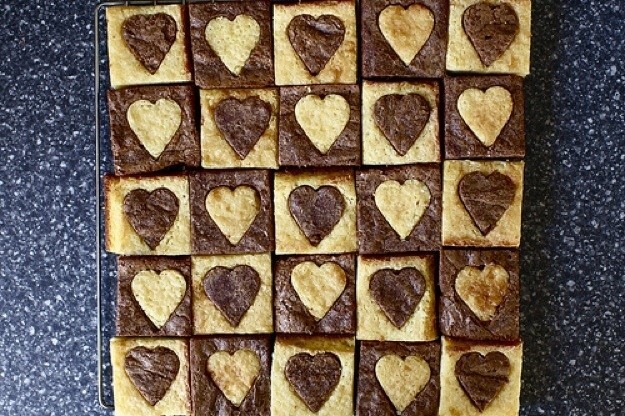 Make a batch each of brownies and blondies and then cut centers out of your squares and swap them out. This photo shows hearts being used, but even just rounds would be lovely. What a grand presentation this makes. 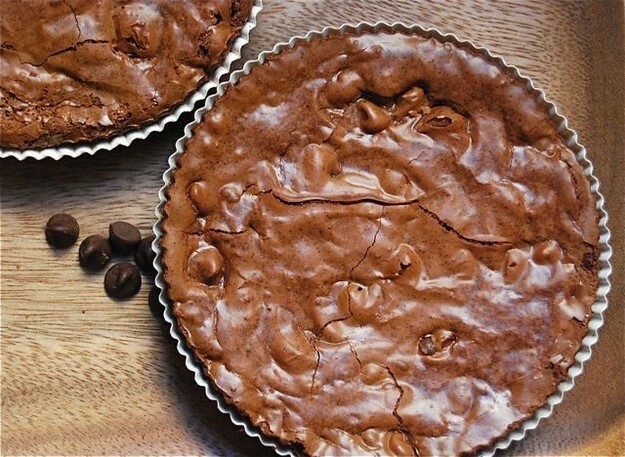 If you're in a hurry, but still want to present with some bling, bake your brownie batter in a large tart pan. To serve, cut the brownie tart in triangle wedges and top each with sweetened chocolatey whipped cream and a garnish of fresh raspberries. 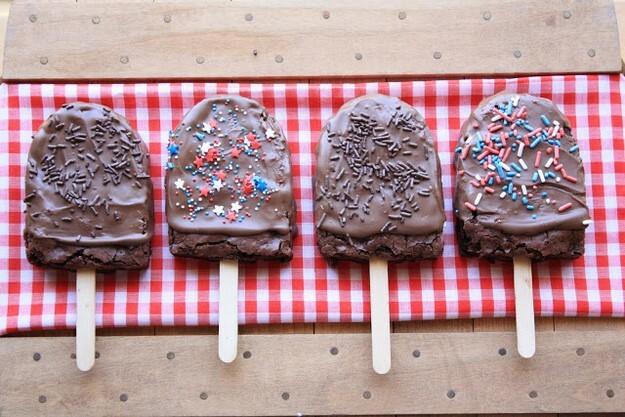 Finally, and this is a favorite idea, cut your brownies in fudgesicle shapes, insert popsicle sticks, dip each one in chocolate icing and polish off with sprinkles. How fun would this be for a picnic? And with Memorial Day coming up (traditionally the first picnic occasion of the year), you might want to seriously consider this idea. Why not add some Bling to the day?